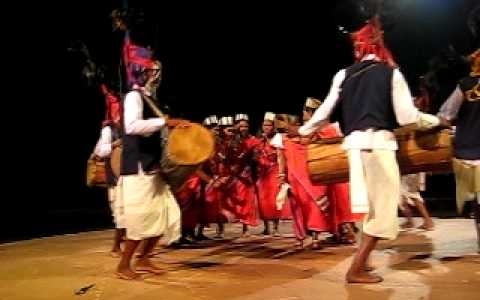 Gaur Maria dance: Gaur Maria dance is performed in Bastar District is a district of the state of Chhattisgarh and some part of Madhya Pradesh. It is the dance form which is performed in order to raise the spirit of Hunting among the people of the tribe. Gaur is the word which stands for ferocious bison in its meaning. The announcement for this dance form is made by using the trumpet of Bamboo or by using the horn. The entry of the men in the floor is very attractive. They enter with the music of flute and the beats of the drums. All the men are meant to wear head dresses which are full of cowries and with the feather of peacock all around. The participants carry dancing sticks called 'Tirududi' in their right hands and tap them according to the drumbeats. They perform in their own groups by the side of the male members. Sometimes, they also take the liberty to cross and re-cross in between the groups of male dancers and drummers. The jingling anklets of the dancers truly correspond to the songs of their lips as they move further in dancing.